Any size weddings and events welcome. Friendly team of experienced and trained pizzaiolos. Want a tailored quote within 24 hours? A Slice Of Happiness. Are you considering pizza catering for your wedding? Then Fallone's authentic artisan pizzas from our wood-fired oven are the perfect option for you! We’re more than happy to tailor our unique setup to your wedding’s theme. Our goal is to make the entire process as simple and stress-free as possible. Our catering horse box trailer is fully independent and requires no external electricity or water supply. We will bring our pizza oven to your wedding location and get everything set up with minimal impact on your planning. Leave the logistics to us! 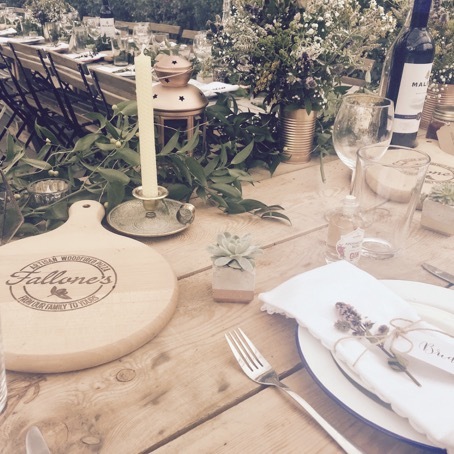 Once we have set up at your wedding our team of expertly trained pizza chefs will stretch, prepare, cook, slice and serve up Neopolitan style pizzas before your eyes! Your guests are welcome to help themselves buffet-style and most people love to watch us at work! We use a combination of locally sourced ingredients from around Scotland, combined with imported Italian ingredients - creating a fusion of flavours. The proof is in the pizza and we pride ourselves on delivering you one of the best tasting pizzas you’ve ever experienced! We serve hundreds of pizzas every month and regularly create new and delicious unique special pizzas. 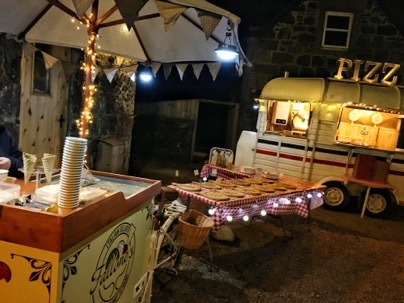 Fallone's Pizza trailer is an ideal size to suit most event venues in an outdoors area. Our large oven reaches temperatures of over 450 degrees and our team can consistently achieve 70 pizzas an hour meaning we can keep up with any number of guests. Whether you want to greet your guests with Canapés (Crostini), or keep them satisfied with a unique evening snack our wedding pizza catering services are the perfect solution for wedding receptions. 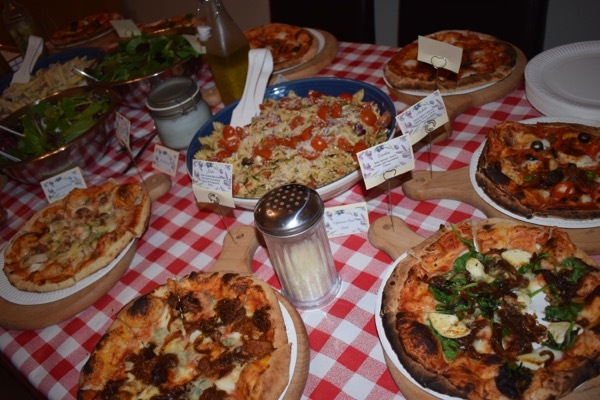 We can cater for a large number of guests at the same time and pizza is an easy handheld food option. 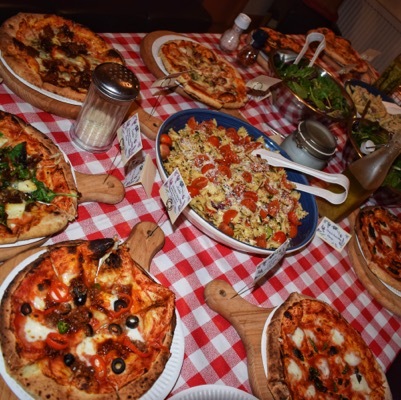 With a choice of pizza options you can cater to everyone’s tastes and ensure each and every guest is left satisfied. Our pizza oven will add a theatrical flair to your reception with your own trained pizza chefs hand preparing pizzas ready to be served buffet style. Our mobile pizza catering solution is fully flexible. We strongly believe that every wedding is a unique event, and we are willing to tailor our service to your special plans. Choose from set menus or feel free to create a bespoke one, we always go the extra mile to ensure our customers, and your guests, are happy. We can also provide a selection of antipasti, side salads & pasta salads to accompany the pizzas. If you are interested in Canapes or Starters then we can offer a selection of crostini too. Finally, starting in 2019 we are offering our own homemade Italian gelato desserts as an option for this summer weddings. 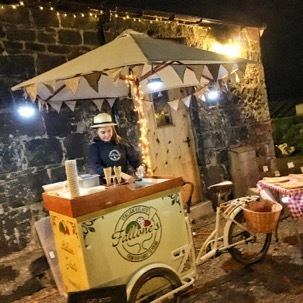 More details on this and our vintage gelato tricycle coming soon! Please see our Frequently Asked Question page for more information of event catering.